WASHINGTON, D.C. -- President Donald Trump's weekly job approval dropped to 35% for the week ending Dec. 3, matching the lowest weekly average of his tenure so far. It is difficult to determine a specific cause for last week's slight decline. The week included the announcement that former White House National Security Adviser Michael Flynn pleaded guilty to lying to the FBI, the continuing focus on the Senate's attempt to agree on a tax reform bill, and Trump's retweeting of anti-Muslim videos originally posted by a right-wing politician in Britain. Trump's weekly approval average fell to 35% twice previously -- for the week ending Oct. 29 and the week ending Aug. 27. The low point in late August was after his comments about both sides being at fault in the race-related violence in Charlottesville, Virginia. In October, the weekly low occurred during a week when Trump disputed an account of a condolence call he made to the widow of a Special Forces soldier after the soldier was killed in Niger. Republicans' approval of Trump has been at 78% in each of the three weeks he averaged 35% approval. 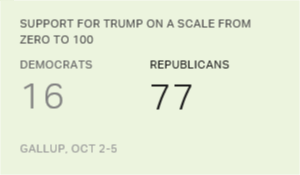 These three 78% weekly readings are the lowest of Trump's term among his party, significantly below the average 83% weekly job approval among Republicans since Trump took office. Democrats' approval rating for Trump remains in the single digits, at 7% last week, while independents' approval is at 32%. Trump's three-day average reached 33% for the three days ending Friday, Dec. 1, tying for the lowest three-day reading of his term. Trump's overall average to date is 39%, and his weekly average has not been above 40% since May. Trump's highest weekly average was his first week in office, at 45%. Explore Trump's approval ratings in depth and compare them with those of past presidents in the Gallup Presidential Job Approval Center. Results for this Gallup poll are based on telephone interviews conducted Nov. 27-Dec. 3, 2017, on the Gallup U.S. Daily survey, with a random sample of 3,552 adults, aged 18 and older, living in all 50 U.S. states and the District of Columbia. For results based on the total sample of national adults, the margin of sampling error is ±4 percentage points at the 95% confidence level. All reported margins of sampling error include computed design effects for weighting.